Last week we had Amish friends down in NC for a few days. They took the train down, and we drove them back up, and of course decided to stay a few days in PA.
Below you’ll see a common sight here in Lancaster County. This was shot last year on an autumn day sometime shortly after sunrise. I have mixed feelings on hot air balloons. I wouldn’t call it an outright fear of heights, more a healthy apprehension of them. I’m not sure how I feel about the basket beneath your feet being the only thing keeping you from plummeting thousands of feet into someone’s hay field. On the other hand it must be just about the best way to see the earth from above. Unobstructed views, wind in your hair. Am I right? I’ve never ridden in one before. Neither have the Amish friends I asked. “What do you think is going through this Amishman’s mind?” asks the person who took this photo. I couldn’t say, but maybe you have an idea. A hot air balloon landed on my Amish neighbors land after hearing how much it cost and how slow it traveled he said “I can travel much faster in my horse and buggy” he clearly was not impressed. I have been in a balloon. There isn’t anymore sense of height and movement than looking down from a window in a tall building. It is very safe. I’d absolutely LOVE to ride in a hot air balloon. Then again I have very little fear of heights. In my first job out of college I was stationed on the South Plains of west Texas and my territory included the majority of far west Texas, the majority of New Mexico and parts of Oklahoma. It was surprising to me how many times I saw balloons floating by when I was out driving around in that big country. One time I had a meeting to attend in Albuquerque,NM and I drove over the afternoon before. Right as I approached the outskirts of the city I went over a small ridge and as I topped the ridge I saw literally hundreds of balloons in the sky. It was a cool, crisp autumn day and in that clear air the sight of all those colorful balloons against that deep blue, cloudless sky was breathtaking. Turns out they were having their annual hot air balloon festival. The balloons that were at a higher altitude were catching the golden rays of the setting sun. The ones at a lower altitude were somewhat in the shadow cast by the Sandia Mountains. It was possibly the most beautiful setting I have ever seen. I stopped and got my camera out, but after thinking it over for a few minutes I put it back up. No way could I ever shoot a picture that would do justice to that scene. My guess is that the Amish person on the bicycle in the photo above was thinking something like; “Those English are sure foolhardy folks to climb into that thing and float around with all of those power lines boxing them in!” At least that is what went through my mind when I saw the photo. I would have found it hard to resist taking that photo. Kudos to you. I usually operate on the premise that at best a semi-justice will be done when I’m taking pictures. I can’t even get close to a window in a high rise building so no I would never get in one of those things! As OldKat stated, the sight of a group of colorful balloons rising on a clear day is breathtaking. However, the one in this picture is covered with advertisement which ruins the picture in my opinion. When they light that torch to make more heat, it’s very noisy. I’d imagine that’s what caused the Amish man to turn around again to look. They were getting a little low, weren’t they? Something I’ve noticed about Amish men (and boys) is that they are always looking at the mechanics of things – even things they have little knowledge or experience with, as if to determine if that’s the best way to design something, in their opinion. It’s a universal trait of the plain male, in my experience. One of my sisters had a hot air balloon ride. As they drifted over the Amish in the Maysville Ohio area, every Amish thrashing crew stopped in their tracks, leaned on their pitch fork and watched the balloon coming their direction and landed in a neighboring field. In no time at all the balloon was surrounded by Amish. The owner knew just what to do, he offered each person a ride if they will help get the balloon deflated and packed for it’s ride back home. 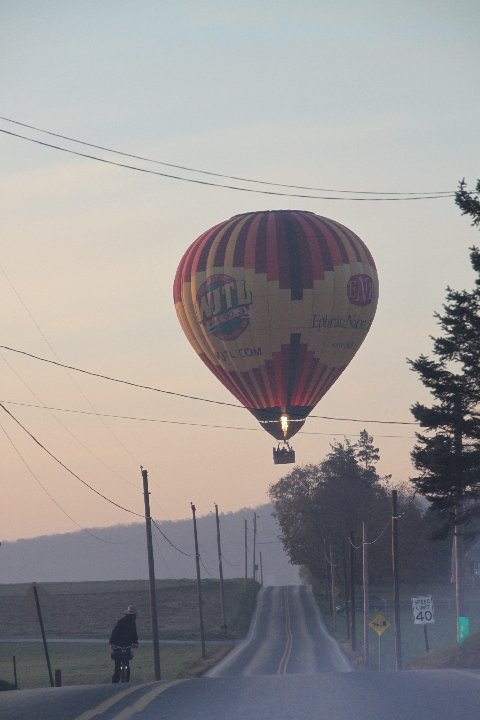 So a number of Amish had their balloon ride and the owner didn’t have to lift a finger to deflate and pack his balloon. Everybody won. I’m scared of heights so there is no way I would do a hot air balloon ride. Although I said I would never do a zip line either and my husband convinced me to do a series of four in Mexico! I would think Amish would like balloon travel. It is dependent on a flame for power, uses physical and mental skill in flying, and is not plugged into any grid of any kind. I’ve lived near “balloon ports” both in Will County, IL & where I live now in McHenry County,IL, so I’m used to seeing hot air balloons (never went up in one—too expensive!) In fact, a former employee of our library and her husband OWN a balloon and used to travel around, participating in various mass launches. When we moved into our current house,24 years ago, when our house was one of a very few in our development, we heard the “whooshing” of the burner of a balloon one Sunday morning (we were familiar with it from our old location). I knew it was close, but didn’t realize HOW close until I waled into the master bathroom,looked up through the skylights, and saw people looking down at me from the balloon’s basket! (At least I was dressed!) It then landed in the then empty lot across the street. The kids (and sometimes we grownups) would get on our bikes and “chase” balloons through the neighborhood, waving at & sometimes talking to folks in the basket(they were often pretty low, since our area has good landing spots). My husband and I went on a balloon ride for our 7th anniversary. We live in Lancaster PA and so a great deal of the ride was over Amish country. It was absolutely spectacular, a crisp fall morning, Amish children running outside, a deer bounding through the trees. I was telling Mark about this and he related to me an incident that he experienced with a hot air balloon. He was on his way to church one Sunday morning a few years back. There was a buggy ahead of him on the same road. Mark heard this weird noise and looked up and a hot-air balloon was coming down right over the tree tops just ahead of the buggies. It just about landed in the road but made it across the road and landed in the field, knocking down a fence in the process. Mark said that hot-air balloons may be nice for humans but the horses were NOT amused. Mark had a terrible time and so did the driver of the buggy ahead of him keeping the horses under control. To humans it’s a hot air balloon. To a horse it is a great big monster coming out of the sky that likes to eat horses. What in the world did those horses think? it must have been a frightening time for them. Even so this makes me giggle, although I am sure it wasn’t funny while it was happening. In my nearly 5 decades of dealing with horses I’d say it is a pretty safe bet that you described EXACTLY how a horse would view this. If horses have any of their wild instincts left it is the instinct for self-preservation. Since in the wild they were prey animals, any perceived threat is viewed as a potential predator and their only real defense is to run. Which isn’t good under almost any circumstance, but when you are out on a highway with a buggy strapped to the horse it is really problematic. …made me chuckle too. I suppose it is about what the animal is used to as well. An 18-wheeler coming at you down a highway is much louder and arguably more fearsome if not quite as large. It’s a monster they know won’t eat them I suppose.